Last week I told you I had one final story to tell you about our experience at Fort Sam Houston. But it didn't completely unfold until this last weekend. Remember the young bride, Crystal? 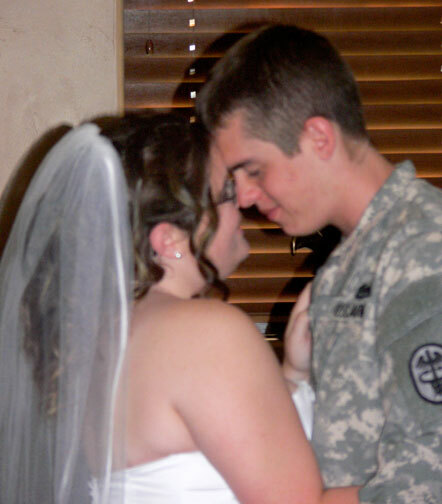 She was going to be marrying her soldier, but had no plans to make her wedding day special. Lauren, one of our Angel Chefs, took Crystal shopping and bought her a simple, lovely wedding gown. It was more than Crystal had hoped for. As the week progressed, we learned more of 19-year-old Crystal's story. Her fiancé, Robert, and she, had been good friends in high school; and as so often happens, that friendship blossomed into love. They corresponded during his deployment in Afghanistan, where he served in the Corps of Engineers, dismantling IEDs. During one such mission, his humvee struck an IED, causing a loss of hearing, back injuries, and a severe case of PTSD. Crystal was his lifeline. She left everything in their home state of Washington, to come to Fort Sam Houston to care for Robert. He suffers from severe bouts of depression and anxiety, as so many of these young soldiers do, and Crystal keeps him grounded. He just wanted to marry her and begin their life together as man and wife. There haven't been many who supported their decision. Everyone from her mother to the Army Chaplains think they are too young, and they are rushing in to this marriage. But when you hear her talk about her love for him, and their dedication to each other, there could be worse reasons to get married. One day, during a conversation with a group of us Angel Chefs, Crystal stated that the only thing that really bothered her about getting married, was that no one would be there to celebrate their wedding with them. It would be conducted by the Chaplain in front of a beautiful waterfall near Freedom Park, but neither of their families could attend. Before I knew it, PLW spoke up and said, "We would love to be there for you. We will be your family!" The smile on Crystal's face was unmistakable. She was delighted! Then she shyly asked him, "Would you walk me down the aisle?" Well, I can tell you that no one had to twist his arm! It would be his honor! 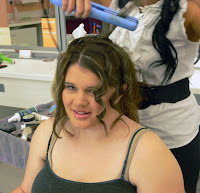 I then announced that we would come in early on Saturday, and I would treat Crystal to a morning at the salon, and we would get her hair and make-up done. When I told the stylist what we were doing, she wanted to be a part of their celebration and offered to reduce her price. When given the opportunity, everyone wants to show their appreciation to our military. Crystal looked so beautiful! It took a little more talking to convince Robert that we didn't want to interfere with their wedding; only make it more special. We had to make him understand that we weren't doing this because we felt sorry for them, or were giving them charity. He needed to understand that we average citizens don't have many ways to give back to them for the sacrifice they make for us. Angel Chefs was one way we could show our gratitude, and if they would let us help them make their wedding a day to remember, then it would be our way to show them respect and honor. 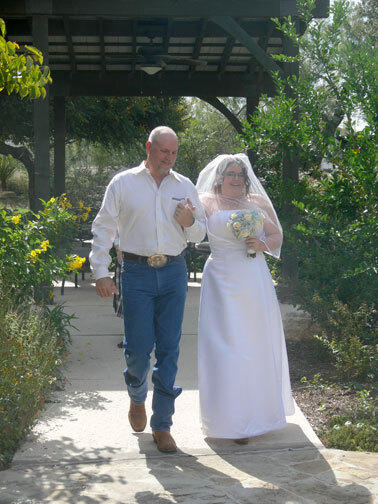 Once he knew our intentions were to make them happy, and that we were there to support their getting married, then his reserved demeanor changed to all smiles and acceptance. The moment came for PLW to walk the bride down the aisle, and although there were only about eight people in attendance --- me; PLW; Angel Chef Lauren; fellow soldier and Best Man, Chris; Uta, a counselor at the Family Center who stood as Crystal's Matron of Honor; a Wounded Warrior in his wheelchair; and another soldier and her daughter --- it didn't matter. Crystal and Robert only had eyes for each other. Robert pulled a piece of paper out of his pocket, and read what were among the most beautiful vows I have ever heard. He proclaimed his undying love for his best friend and bride, and vowed to love her every day of his life; to protect her; care for her; and honor her. We all shed a tear. For her part, in the mad dash to get ready, Crystal had forgotten her written vows back in the dressing room, but PLW calmed her fears and told her to just speak from her heart; tell Robert what he meant to her and what she hoped for in this marriage. Her vows were as open and honest as any I've heard. Who said they were too young to know what they wanted and what marriage is all about? They exchanged their rings, Robert lifted his bride's veil and they fell into each other's arms. The smiles on their faces said it all! We all convened to the Conference Room at the Warrior Family Center, where the administrators had a small wedding cake. They sipped fake champagne from fluted glasses, stuffed cake in each other's faces, and no one with a Dom Perignon and lobster wedding could have enjoyed it more! We watched them dance their first dance as husband and wife to a song played from Robert's computer, and as you can see by this photo, they were in a world of their own. We slipped them some money to enjoy a nice dinner that evening, and left them to begin their life together. We have promised to stay in touch with them and want them to truly consider us their family-away-from-home. We cautioned them to ask God to be at the center of their marriage and there would be no obstacle they couldn't overcome, or hill they can't climb. And that is something we, as a nation, need to earnestly pray for. It was our experience that these young men and women in the military do not know God. I cannot imagine going into war without Jesus by my side. So, I hope I have faithfully represented what my time at Fisher House gave me. The blessings I received were far greater than any gifts we provided. I had the opportunity to look members of our military in the eye and say, "thank you." These were personal encounters, affairs of the heart, and individuals that I will never forget. I pray for their protection, their healing, and above all else, their salvation. May God shelter them under His wings as He leads them into battle. God keep them, every one! Psalm 61:3-5 "For you have been my refuge, a strong tower against the foe. I long to dwell in your tent forever and take refuge in the shelter of your wings. For you, God, have heard my vows; you have given me the heritage of those who fear your name." What a wonderful, happy story. I'm so glad you and PLW were able to be such a supportive part in it. In ordinary circumstances, I would probably caution them about being so young, too. But this isn't an ordinary circumstance. And these aren't two ordinary young people. I wish them every happiness, full recovery, and a long lifetime together. From previous conversations, you know I often struggle with my faith. It is every-day miracles like this and godly people like you & PLW that do more to strengthen me than anything else. You often say that you are grateful for veterans' service. Let me say that it was and is the honor of every service member to know America is made of people like you. Hmmm.... I seem to be having the same problem with my eye. While I am humbled by your gratitude to us, it was nothing compared to what they are willing to do for us and our country. I saw so much dedication and commitment from so many young couples just like them (many with children less than a year old), and believe me they are stronger than I think I could be in the same situation. The thing that bothers me more than anything else is, is that there needs to be more interaction between the American people and our military. I worry that we are two exclusive groups that really need to know and support each other. I worry that they are so secluded within their "brotherhood", and the public is so immersed in their day-to-day lives, that we lose sight of each other in what should be a mutual support system. We are just trying to do our small part in letting them know we care. Just wish I could do something every day! It truly is hard to drive away from these young heroes and their families. I'm just thankful that God has given us a way to show others that He loves them. And THANK YOU for your service, too! It's your love of this country and our military that cements our friendship. Just chalk it up to another one of those "coincidences" that God is so good about arranging! What a wonderful story! I truly send my best wishes and blessings to this young couple. Hey, my parents married really young and it wasn't because they felt that they had to, they wanted to. They've been married 64 years and wouldn't know what to do without one another, so I think it really doesn't matter in many ways how young you are, it has to do with the individual couple, right?! It was wonderful that you and your husband were there for them as well as the others who participated and I'm sure this young couple truly appreciates it and it will leave them with lots of loving, kind memories to always cherish. God bless you and your husband and this young couple with His blessings. Thanks for sharing this very uplifting, personal story. Lisa, I am so glad that people get to hear Crystal and Robert's story, and I ask everyone to keep them in your prayers. I want them to know they have a nation who cares about them and a God that loves them.